Accessories and furniture that will remind you of a rustic escape. If there's one overarching decor trend with serious staying power right now, it's the modern farmhouse look. And thanks to inspiration sources like Pinterest and Instagram we have no shortage of beautiful homes to to inspire our own at-home aesthetic. The modern farmhouse look isn't about making your living room look as much like a barn as possible. 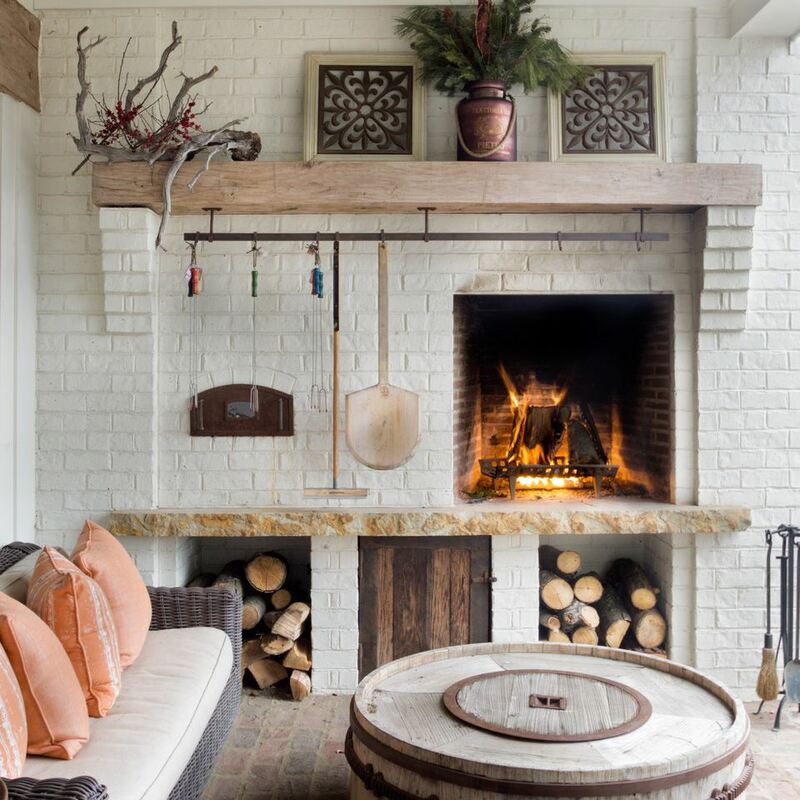 Rather, we like to think of it as infusing your home's style with rustic and vintage touches. Ahead, we found 15 pieces you can add to your house to channel that modern farmhouse look without going over the top. 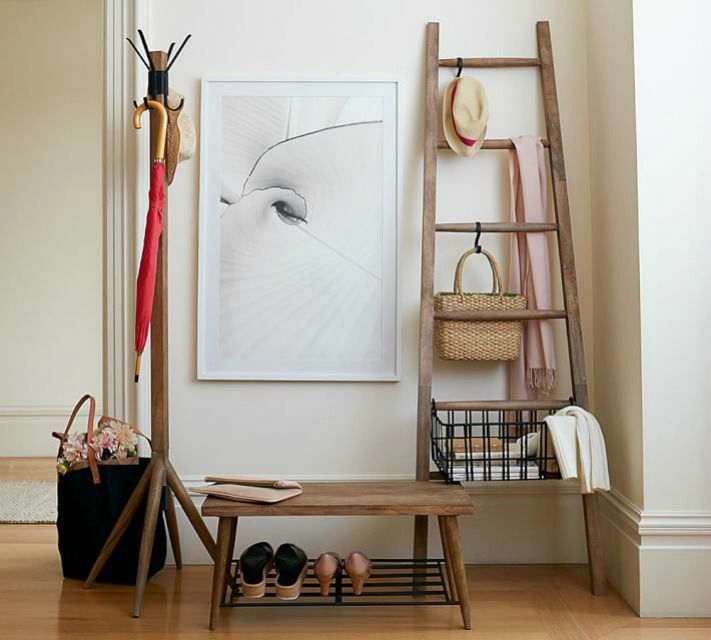 As both a convenient storage spot for blankets and a rustic design element, we love the look of a wooden ladder leaned against a wall that could use a little bit of decoration. One of the essential elements of the modern farmhouse home is the rustic wood dining table. For seating we would suggest either benches that echo the style (with a sheepskin throw or two for comfort) or industrial-style metal chairs. Adorn your table with a linen runner and glass hurricanes filled with candles. We love the way that The Painted Porch has put this coal scuttle to use as a pretty and practical way to store various accessories in your guest bathroom—like hand towels and soap and perhaps a sachet of lavender. For some serious countryside charm, gather people around your dining table or breakfast nook in vintage-inspired Shaker chairs. These glossy chairs from Serena & Lily come in a rainbow of colors from this bright geranium red to sunny yellow and Robin's Egg blue. Bring a touch of the barn inside with these vintage-inspired gears. Arrange this set of three together on one wall, mix them in with art pieces on a gallery wall or sprinkle them throughout your home for surprise touches of farmhouse chic. White enamelware like this will look stylish and sophisticated in any home. The look is rustic enough, though, to perfectly complement a modern farmhouse kitchen. Perhaps you live in an urban high-rise apartment or a pretty suburb that feels miles away from rural country. You can bring some of that pastoral beauty indoors with one of Anthropologie's unique wall art pieces. To really bring the farmhouse feeling to life in your home, switch out your door for a sliding panel door like this one from Rustica Hardware. It has the look of a barn door with polished industrial details that maintain a modern look. This pretty painted mailbox may not be quite practical enough for literal use outside your home, but it can make a great place to stash your mail inside, or any other knick-knacks you might want to keep out of sight. We love the look of these French grain sack pillow covers. They are simple enough to work in almost any home decor scheme, but they are perfectly suited for your modern farmhouse look. Rustic and charming, these milk buckets make an convenient vessel for dried flowers like lavender or other fragrant blooms, or can function as storage for any number of knick-knacks around the house. The right lighting piece can become the focal point of any room. To draw your modern farmhouse look together, try an industrial pendant light or "chandelier." A washed wood bed frame will give your bedroom a warm and inviting country feel. We recommend layering up your bed with quilts and printed sheets in washed out florals and stripes.